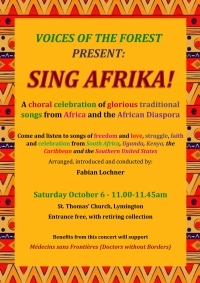 Come along and hear us perform a range of songs from around the world. You can also Like our Facebook page so you can be kept up to date with concerts, news and events. This will be our only public Christmas performance this year. BEHOLD THE STAR - Heavenly Harp and Angelic Voices. 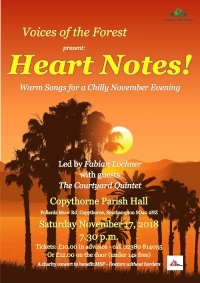 This concert will feature a program of Christmas songs from around the world and a program of harp music. It will be held on Saturday 9th December at St Mary Magdalene Church, Church Ln, New Milton BH25 6QN. Start time: 7.30pm Tickets: £10 (under 14s free) - you can send us a message via our contact form, or phone: 023 8081 1634 Refreshments will be available. 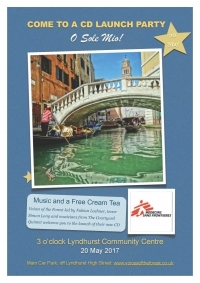 Proceeds from ticket sales, donations and raffle to be donated to Medecins Sans Frontieres (Doctors Without Borders). You are warmly invited to a launch event for our new Italian-themed CD titled "O Sole Mio" featuring the Voices of the Forest choir, acclaimed tenor Simon Long and the classical group the Courtyard Quintet. This will be held at the Lyndhurst Community Centre at 3pm on Saturday 20th May. 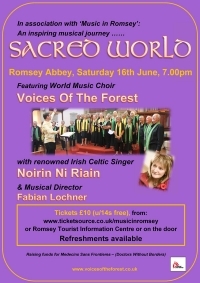 The choir will be singing a selection of the songs from the CD at this informal event. Refreshments will be served in the form of a delicious cream tea and this promises to be a fun and entertaining event. Lyndhurst Community Centre is located in the main car park in the centre of Lyndhurst. This event is free and includes a free cream tea! 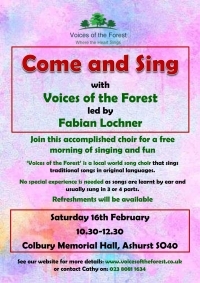 We are hosting a free workshop for anyone to come along and have a go at singing with the choir. 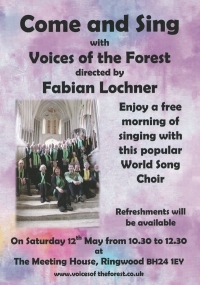 This informal fun event will be a chance to meet the choir, hear us sing and have a go yourself! 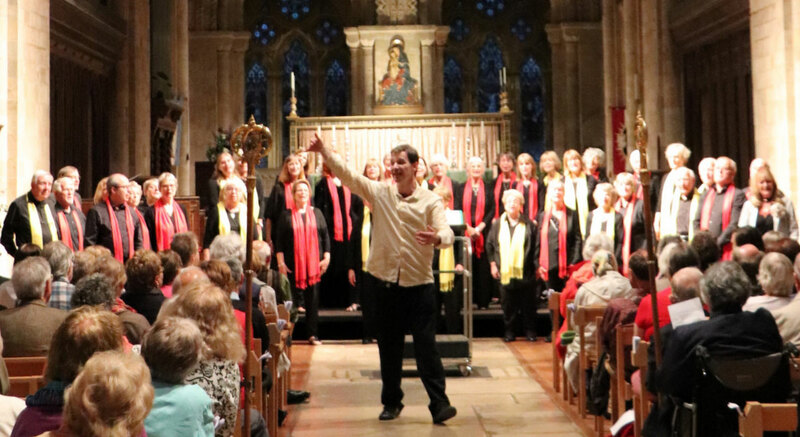 If you've ever been tempted to join a community choir, this could be your chance to dip your toe in the water! No need to book, just turn up. Entrance is free.